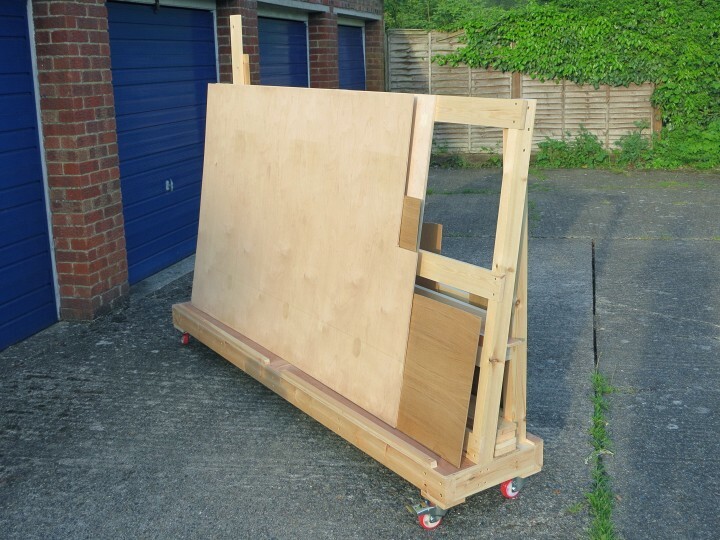 This mobile lumber cart allows easy movement and compact storage of sheet materials, offcuts and and a small amount of timber stock. 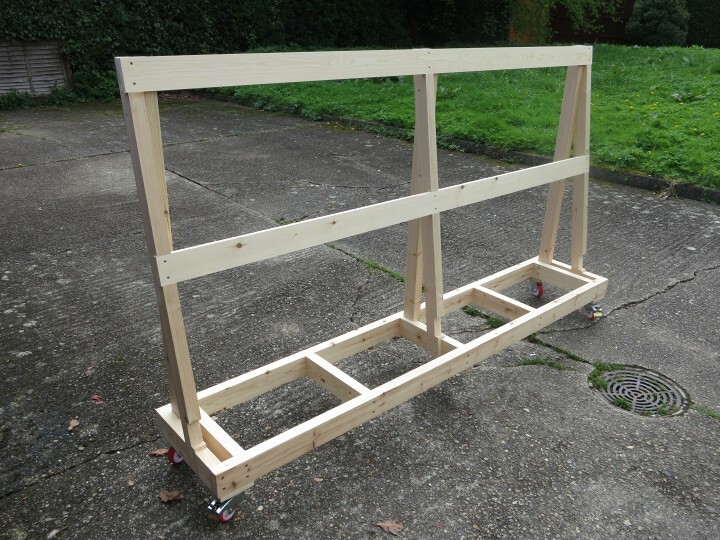 I designed it to slide down the side of my garage so it's only about 18 inches deep. 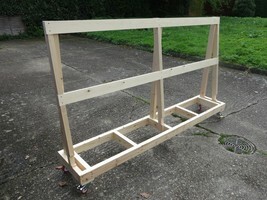 It will carry up to 6 sheets of ¾" material. You'll notice that I've specified 2.7m lengths for the timber, which you can easily get in the UK from a timber merchant. 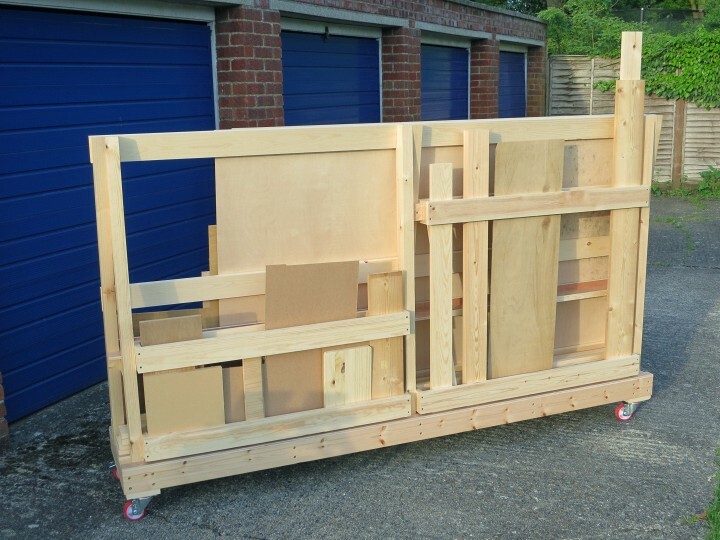 DIY store standard 2.4m lengths will also work, but you'll need 6 lengths of 2×3 instead of 3 for the upright frames, and the finished cart will be 40mm shorter than a standard plywood sheet. As with any project you should order extra materials to allow for mistakes or bad stock. 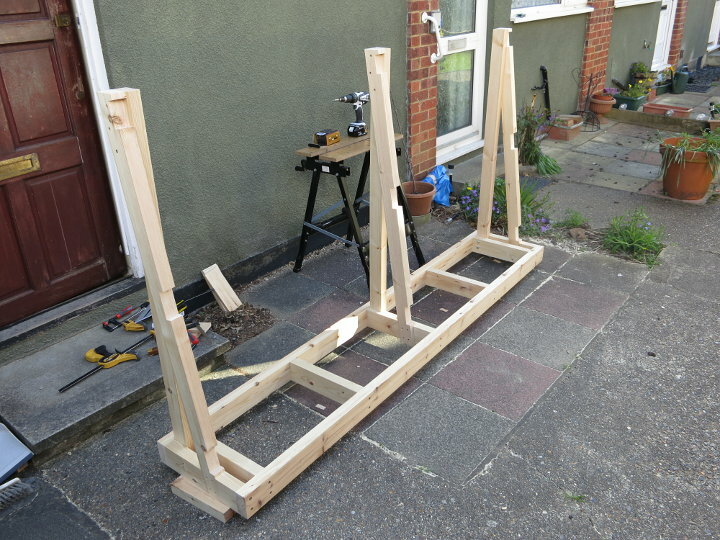 First cut your uprights to length. 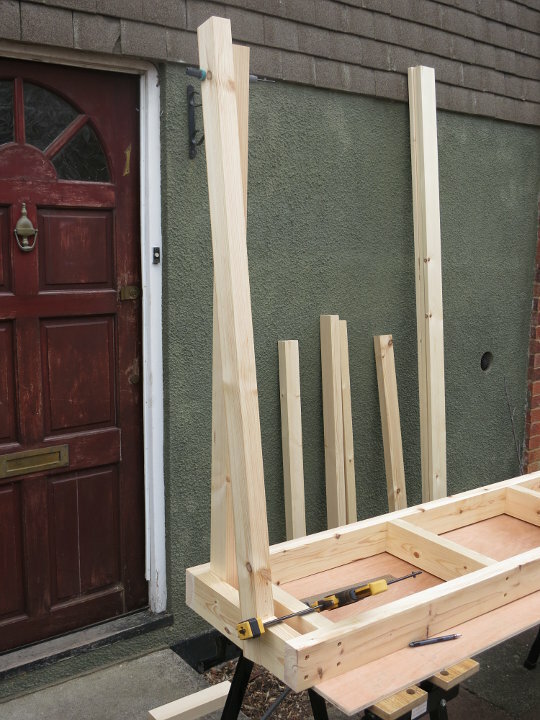 The vertical uprights are 1305mm long and the sloping uprights are about 1390mm long at this point, so you'll get one of each out of a 2.7m length of timber. The sloping uprights are longer than needed and will be trimmed to their final length later. Also cut 7 360mm lengths of 2×4 and 2 2440mm lengths of 2×4 for the base frame. 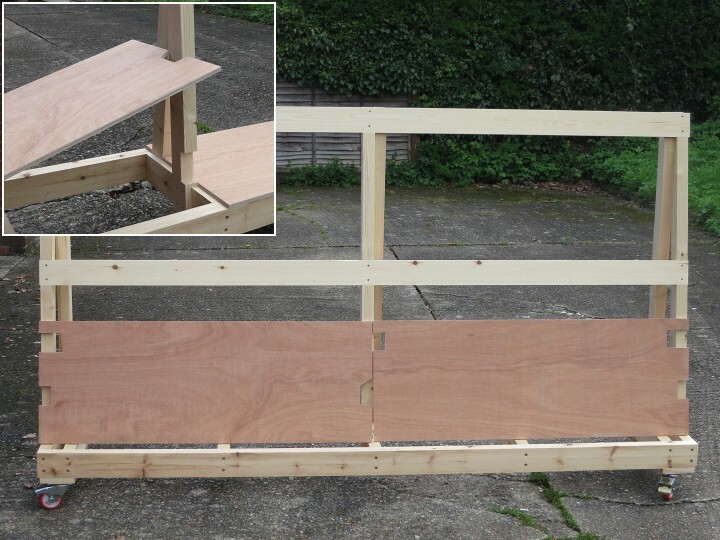 Now you can lay out some of the pieces on your bench as per the diagram above, to figure out the angles. 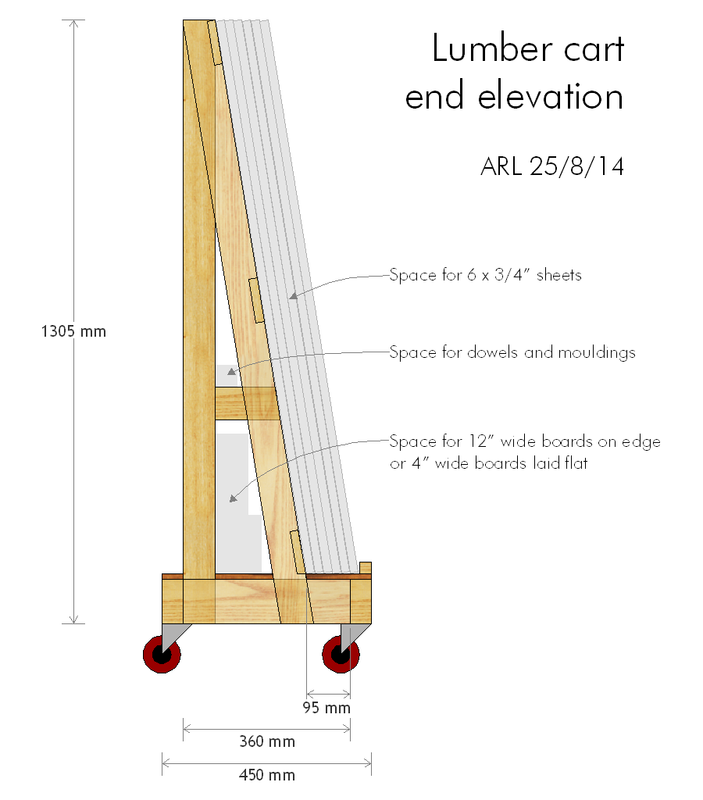 There are a lot of cuts at this angle (which is about 9°) so it's worth making a saw guide like this to use with your circular saw. 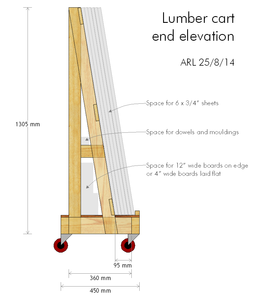 Here's an illustration of using the saw guide in conjunction with a circular saw to cut out the half-laps in the base that will receive the uprights. 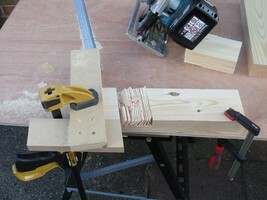 Only two of the 360mm pieces need a half lap cut in them. 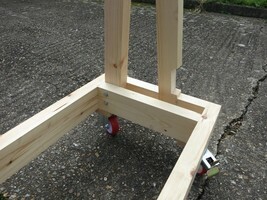 Screw the base frame together using 6mm × 100mm (#12 × 4") screws, two at each joint. Glue isn't necessary. The two pieces with the half-laps go at the ends. 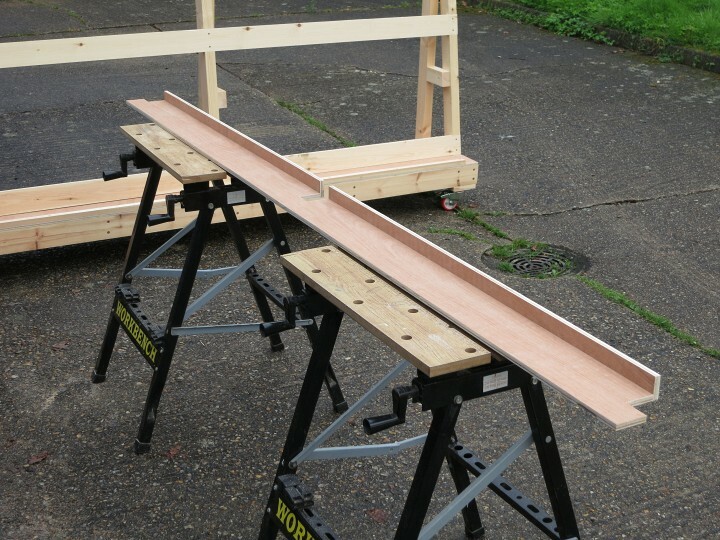 All 3 of the longer uprights need an angled half-lap cut at their bottom end. 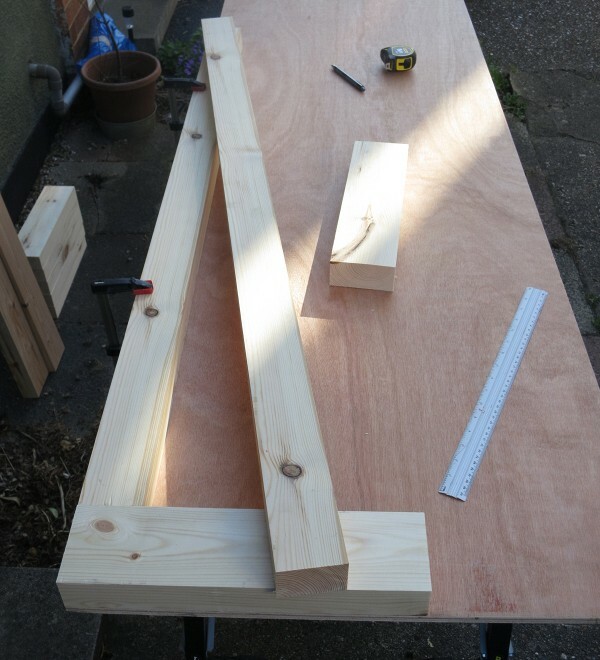 Having cut these, you can clamp the upright pieces in position, check for plumb, mark and cut the long uprights to their final length. 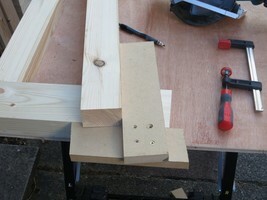 The sloped uprights each need 3 cut-outs in their front edge to accept the 1×4 cross-braces - one at the top, one half-way up and one near the bottom, shown here. When positioning the bottom cut-out, don't forget to allow for the thickness of the deck. 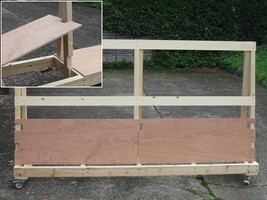 ...and install the casters and the top two 1×4 cross braces. 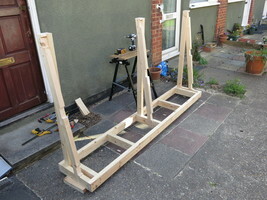 Don't fit the lower cross brace yet: the deck needs to be fitted first. If you loaded up the cart with 6 sheets of 18mm MDF, that's 240kg on its own, before you've even considered the weight of the cart itself and anything else it's carrying, so heavy-duty casters are essential. All four casters swivel and are braked. Here's a detail of how the end uprights join to the base frame. 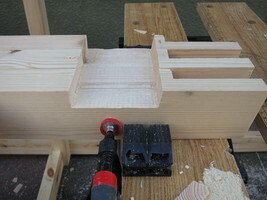 And here's how the middle pair of uprights is join to the base. Now for the deck. 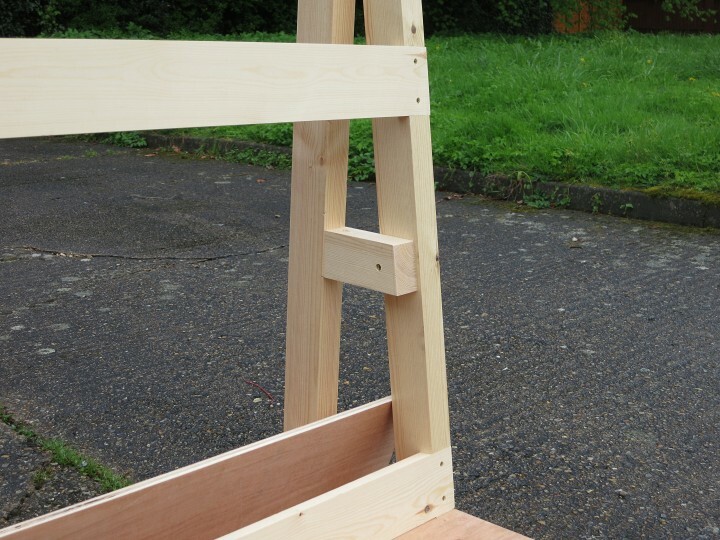 This has to be made in two pieces, with notches cut out to fit around the uprights. 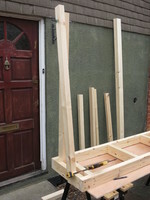 On the left half of the deck, an enlarged notch is required to clear the front-centre upright as the deck is lowered into place (inset). Once the deck has been screwed down, the final 1×4 cross-brace can be fitted at the bottom of the uprights. 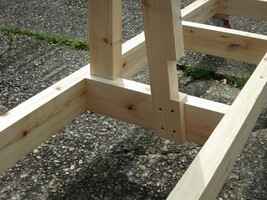 Small cross pieces are also installed on each pair of uprights, to turn them into A-frames. 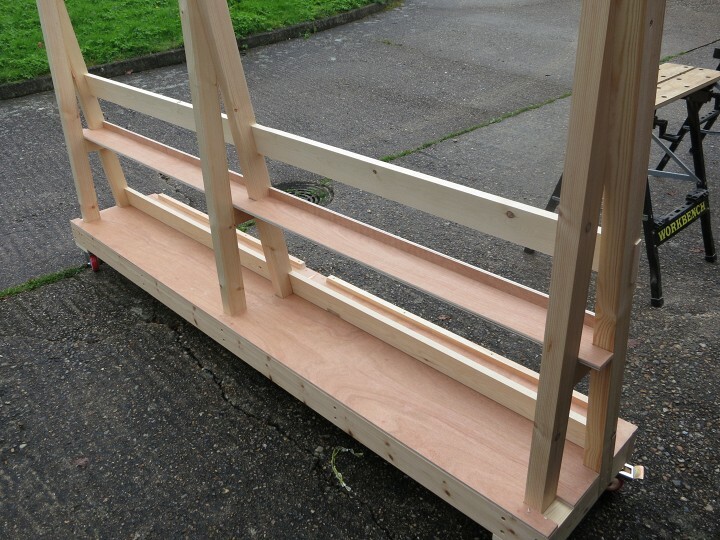 There should be just enough left from the half-sheet of plywood to make a shelf like this, which will sit on the A-frame cross pieces and provide storage for mouldings and dowels. It's notched out to fit around the uprights. The shelf has to be slid between the uprights on edge and then rotated into place. 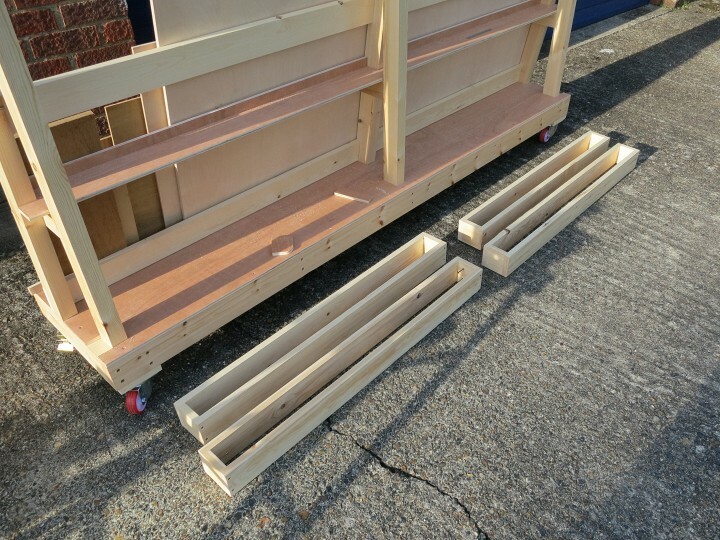 These open-bottomed boxes made from 1×4s will fit between the rear uprights to provide storage for off-cuts. I fixed the boxes at different heights for short and long off-cuts. The bottom boxes are installed slightly above the deck, so there's a gap where sawdust can be swept out. 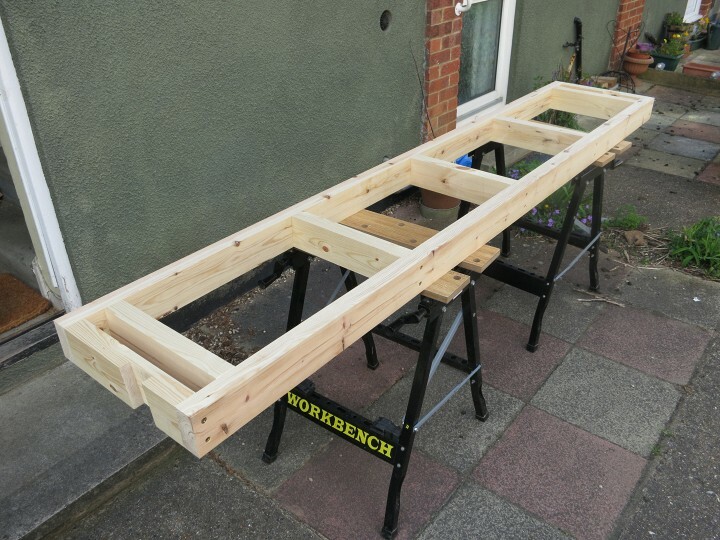 The final touch is to screw some strips of 25mm (1") square material at the front of the deck to prevent the sheet materials from slipping off.